The third week of the season saw several athletes posting city-best marks at the Burges Invitational and the Bowie/Cathedral Invitational. Cathedral senior and University of Texas commit Brandon Seagreaves pulled off an impressive double with two city-best performances winning the 3200-meter run in 9:36.51 and the 1,600-meter run in 4:24.33. Both races were highly competitive at the Bowie/Cathedral Invitational. *Liam Walsh, Coronado, 1:55.75 in the 800 meters. *Ethan Villa, Austin, 50.24 in the 400 meters. *Infante Jones, Parkland, 40.32 in the 300 hurdles. *Joshua White, Burges, 48.32 in the 400 meters. *Isaiah Davis, Pebble Hills, 22.06 in the 200 meters. *Franklin’s 1,600-meter relay team, 3:21.37. *Caleb Gerber, Pebble Hills and Christian Matamoros, Burges, 6-feet, 4 inches in the high jump. *Keith Rodriguez, Eastlake, 14 feet in the pole vault. *Gabriel Stonewall, Franklin, 46-feet, 3 inches in the triple jump. *Misael Ortiz, Socorro, 53-feet, 1.5 inches in the shot put. Here are Saturday’s results from Bowie www.runnercard.com/runner/data/172096/1002331/result/Bowietf2019.pdf and the results from Burges – www.runnercard.com/runner/data/172096/1002333/result/Burgestf2019.pdf. Canutillo Boys/Girls: 3:30 p.m. Friday and 8:30 a.m. Saturday. Parkland, Canutillo, Faith, Loretto, Cathedral, Eastlake Americas, Parkland, Coronado, Burges, Franklin, Chapin, Bowie. Discus: 1, Johnny Cerros, Franklin 158 feet; 2, Misael Oriz, Socorro, 157-4; 3, Andrews Bristol, Franklin, 154-4; 4, David Moreno, Jefferson 152-10; 5, Zachary Cyrus Pomele, Pebble Hills, 150-4; 6, David Moreno, Coronado, 141-9; 7, Adam Vick, Franklin, 139-7; 8, Jalen Henderson, Americas, 139-0; 9, Tony Holguin, San Elizario, 138-1; 10, Garrett Stokes, Burges, 134-11. Shot put: 1, Misael Ortiz, Socorro, 53-1.50; 2, Garrett Strokes, Burges, 52-8.5; 2, Jonathan Lopez, Montwood, 48-08; 3, Johnny Cerros, Franklin 48-04; 4, Andrew Bristol, Franklin, 48-00.50; 5, Arturo Jimenez, Horizon, 47-9.50; 6, Lean Smith Jr., Franklin, 46-8; 7, David Moreno, Coronado, 45-7.50; 8, Nick Kim, Americas, 45-6; 9, David Moreno, Jefferson, 44-11.5; 10, Noe Moreno, Canutillo, 44-6. High jump: 1, Caleb Gerber, Pebble Hills, 6-4; 1, Christian Matamoros, Burges, 6-4; 1, Evan Chisolm, Americas, 6-4; 4, Ethan Villa, Austin, 6-2; 5, Evan Chisolm, Americas, 6-0; 5, Adrian Donacio, Eastlake, 6-0; 7, Ivann Alvarez, Americas, 5-10; 7, Sal Gandara, Mt. View, 5-10; 7, Dominic Britton, Chapin, 5-10; 7, Joshua Sanchez, Anthony, 5-10; 7, Khyrie Murdaugh, Irvin, 5-10; 7, D’Andre Ray, Eastlake, 5-10. Pole vault: 1, Keith Rodriguez, Eastlake, 14-0; 2, Daniel Cardenas, Mt. View, 12-0; 3, Matthew Sanchez, Coronado, 11-6; 3, Armando Villa, Americas, 11-6; 3, Alan Garcia, Mt. View, 11-6; 3, Angel Escalera, Parkland, 11-6; 7, Daniel Larios, Coronado, 11-0; 7, Austin Lara, Del Valle, 11-0; 7, Sebastian Deras, Del Valle, 11-0; 7, Andrew Almanza, Mt. View, 11-0. Long jump: 1, Deion Hankins, Parkland, 21-4; 2, Daniel Rivera, Horizon, 20-10.5; 3, Derek Saldivar, Americas, 20-8; 3, Zacarias Velasquez, Americas, 20-8; 5, Tavorus Jones, Burges, 20-6;; 6, Angel Jurado, Franklin, 20-5; 7, Vince Armendariz, Americas, 20-4.50; 8, Onterious Hill, Chapin, 20-4; 9, Ethan Villa, Austin, 20-3.50; 10, Keith Rodriquez, Eastlake, 20-1.50. Triple jump: 1, Gabriel Stonewall, Franklin 46-3; 2, Kamuel Sloan, Franklin, 43-10; 3, Julian Hinojos, Americas, 43-1.50; 4, Takeem Thomas, Eastwood, 42-8; 5, Donta Hayes, Parkland, 42-4.50; 6, Daniel Rivera, Horizon, 42-2; 7, Marcos Duran, Mt. View, 41-4.25; 8, Gilbert Rodriguez, Mt. View, 41-2.75; 9, Michael Haack, Franklin, 41-2.50; 10, Angel Escalera, Parkland, 40-9. 100 meters: 1, Caleb Gerber, Pebble Hills, 10.81; 2, Abel Cervantes, Americas, 10.93; 3, Fred Hernandez, Socorro, 11.03; 4, Angel Garcia, San Elizario, 11.26; 5, Oscar Lozano, Franklin, 11.31; 5, David Niebla, Montwood, 11.31; 7, Cedric Haynes, El Dorado, 11.35; 8, Ryan Acosta, Americas, 11.37; 9, Jeff Griffin, Andress, 11.40; 9, Ricky Espinoza, El Dorodo, 11.40. 200 meters: 2, Isaiah Davis, Pebble Hills, 22.06; 2, Abel Cervantes, Americas, 22.16; 3, Ian Tharp, Franklin, 22.78; 4, Julian Hinojos, Americas, 22.79; 5, Ryan Acosta, Americas, 22.86; 6, Irvin Lopez, Del Valle, 22.92; 7, Omajuwa Etiwe, Franklin, 23.03; 8, Kameron Walker, Austin, 23.09; 8, Alex Devora, San Elizario, 23.09; 10, Julian Mendoza, Hanks, 23.19. 400 meters: 1, Joshua White, Burges, 48.32; 2, Omajuwa Etiwe, Franklin, 49.72; 3, Julian Hinojos, Americas, 49.90; 3, Michael Abeyta, Hanks, 49.90; 5, Ethan Villa, Austin, 50.24; 6, Ian Tharp, Franklin, 50.65; 7, Sam Zambrano, Burges, 51.12; 8, Matthew Flowers, Canutillo, 51.48; 9, Michael Garcia, Eastlake, 51.68; 10, Alex Devora, San Elizario, 51.70. 800 meters: 1, Liam Walsh, Coronado, 1:55.75; 2, Noah Yeager, Burges, 1:57.22; 3, Alan Alba, Coronado, 1:57.24; 4, Fernando Morales, Franklin, 1:57.44; 5, Thomas Magee, Chapin, 1:59.61; 6, Matthew Lindsey, Montwood, 2:00.60; 7, Edwin Gomez, San Elizario, 2:01.69; 8, Michael Abeyta, Hanks, 2:01.78; 9, Joshua Gonzalez, Mt. View, 2:02.30; 10, Leonardo Gerardo, Cathedral, 2:03.14; 10, Nathan Solis, Fabens, 2:03.14. 1,600 meters: 1, Brandon Seagreaves, Cathedral, 4:24.33; 2, Edwin Gomez, San Elizario, 4:25.63; 3, Liam Walsh, Coronado, 4:27.33; 4, Elias Perez, Eastwood, 4:27.75; 5, Michael Abeyta, Hanks, 4:28.59; 6, Sergio Leon Cuartas, Eastwood, 4:29.98; 7, Rodger Rivera, Hanks, 4:30.95; 8, Alan Alba, Coronado, 4:32.04; 9, Tyler Rodriguez, Americas, 4:32.80; 10, Jacob Ye, Americas, 4:32.90. 3,200 meters: 1, Brandon Seagreaves, Cathedral, 9:36.51; 2, Edwin Gomez, San Elizario, 9:46.30; 3, Nick Gonzalez, Coronado, 9:53.95; 4, Rodger Rivera, Hanks, 9:54.55; 5, Tyler Rodriguez, Americas, 9:57.55; 6, Juan Olmos, Eastwood, 10:00.34; 7, Israel David, Eastlake, 10:00.78; 8, Sergio Leon Cuartas, Eastwood, 10:02.15; 9, Carlos Armendariz, Eastlake, 10:04.94; 10, Nathan Hernandez, Eastwood, 10:04.96. 110 meter hurdles: 1, Infante Jones, Parkland, 15.11; 2, Dominic Britton, Chapin, 15.40; 3, Jacob Luna, Eastwood, 15.52; 4, Joshua Massaquoi, Franklin, 15.68; 5, Chris Martinez, Franklin, 15.70; 6, Caleb Stewart, Americas, 15.71; 7, Vince Armendariz, Americas, 15.85; 8, Donta Hayes, Parkland, 15.99; 9, Gavin Hidalgo, Eastwood, 16.25; 10, Bryan Suarez, Chapin, 16.45. 300 meter hurdles: 1, Infante Jones, Parkland, 40.32; 2, Vince Armendariz, Americas, 40.77; 3, Chris Martinez, Franklin, 41.02; 4, Alex Colmenero, Parkland, 41.28; 5, Angel Escalera, Parkland, 42.20; 6, Jonathan Plascencia, Jefferson, 42.52; 7, Gavin Hidalgo, Eastwood, 42.55; 8, Dominic Britton, Chapin, 42.63; 9, Joshua Massaquoi, Franklin, 42.87; 10, Gianluca Cuevas, Del Valle, 42.97. 400 meter relay: 1, Americas ‘A’ (Armando Villa, Abel Cervantes, Ryan Acosta, Julian Hinojos), 43.03; 2, Pebble Hills ‘A’ (Caleb Gerber, Jim Edward, Jalen Partida, James Hadnot), 43.36; 3, Franklin ‘A’ (Darryn Clark, Angel Jurado, Isreal Hudson, Ethan Bustillos), 44.18; 4, El Dorado ‘A’ (Duane Nelson, Cedric Haynes, George Graham, Chris Bustillos), 44.43; 5, Austin ‘A’ (Kevin Usera, Freddy Elizondo, Moises Morales, Kameron Walker), 44.51; 6, Ysleta (Jalen Promesse, Elias Medel, Giovanni Martinez, Damian Carrasco), 44.70; 7, Burges, 44.83; 8, Montwood ‘A’ (David Niebla, Carlos Cisneros, Carlos Flores, Evan Cisneros), 44.88; 9, Canutillo (Carlos Amato, Matthew Flowers, Alejandro Alvarado, Sebastian Garcia), 44.91; 10, Eastwood, 45.01. 800 meter relay: 1, Americas ‘A’ (Ryan Acosta, Abel Cervantes, Julian Hinojos, Armando Villa), 1:30.07; 2, Franklin ‘A’ (Darryn Clark, Angel Jurado, Ian Tharp, Omajuwa Etiwe), 1:30.32; 3, Pebble Hills ‘A’ (Isaiah Davis, Ian Edward, Sebastian Ochoa, Galeb Gerber), 1:31.14; 4, Austin ‘A’ (Moises Morales, Kameron Walker, Miguel Vazquez, Kevin Usera), 1:31.17; 5, Eastwood ‘A’ (Marcus Ransom, Xavier Avila, Osmar Ibarra, Eddie Cruz), 1:32.85; 6, Montwood ‘A’ (Diego Herd, Angel Robles, Max Ayala, Brandon Williams), 1:34.34; 7, San Elizario ‘A’ (Jerry Anderson, Chirs Olvera, Alexis Gurrola, Angel Garcia), 1:34.46; 8, Ysleta, 1:34.42; 9, El Dorado ‘A’ (Duane Nelson, Cedric Haynes, Geroge Graham, Chris Bustillos), 1:35.29; 10, Irvin, 1:35.77. 1,600 meter relay: 1, Franklin ‘A’ (Ian Tharp, Ethan Bustillos, Fernando Morales, Omajuwa Etiwe), 3:21.37; 2, Americas ‘A’ (Ryan Acosta, Julian Hinojos, Sir Drennan, Abel Cervantes), 3:24.33; 3, San Elizario ‘A’ (Alex Devora, Alexis Maldonado, Tony Diaz, Alexis Gurrola), 3:30.59; 4, Eastlake ‘A’ (Kevin Aravelo, Lorenz Smith, David Christobal, Michael Garcia), 3:30.66; 5 Austin ‘A’ (Steven Montoya, Miguel Vazquez, Andrik Zamora, Ethan Villa), 3:30.89; 6, Parkland ‘A,’ 3:32.42; 7, Burges, 3:32.54; 8, Coronado ‘A’ (Nick Gonzalez, Josh Espino, Alan Alba, Liam Walsh), 3:32.92; 9, Montwood ‘A’ (Matthew Lindsey, Brandon Williams, Kenneth Dominguez, Christian Rivera), 3:35.60; 9, Eastwood, 3:36.68; 10, Chapin, 3:37.46. Week three promises to be an exciting weekend of high school track and field. Discus: 1, Johnny Cerros, Franklin 158 feet; 2, Misael Oriz, Socorro, 157-0; 3, Andrews Bristol, Franklin, 154-4; 4, David Moreno, Jefferson 152-10; 5, Zachary Cyrus Pomele, Pebble Hills, 150-4; 6, Adam Vick, Franklin, 139-7; 7, Jalen Henderson, Americas, 139; 8, David Moreno, Coronado, 137-8; 9, Tony Holguin, San Elizario, 136-11; 10, Brandon Bailey, El Dorado, 134-1. Eastlake’s Keith Rodriguez vault of 13-feet, 6-inches is tops in the city. Matthew Sanchez from Coronado, is second (11-6). Shot put: 1, Garrett Strokes, Burges, 52-8.5; 2, Johnny Cerros, Franklin 48-04; 3, Andrew Bristol, Franklin, 48-00.50; 4, Arturo Jimenez, Horizon, 47-5; 5, Lean Smith Jr., Franklin, 46-8; 6, David Moreno, Jefferson, 44-11.5; 7, Noe Moreno, Canutillo, 44-6; 8, Jonathan Lopez, Montwood, 43-10; 9, Tafua Taufafa, El Dorado, 43-6; 10, David Moreno, Coronado, 43-6. Pole vault: 1, Keith Rodriguez, Eastlake, 13-6; 2, Matthew Sanchez, Coronado, 11-6; 3, Daniel Larios, Coronado, 11-0; 3, Austin Lara, Del Valle, 11-0; 3, Sebastian Deras, Del Valle, 11-0; 6, Alan Garcia, Mt. View, 10-6; 7, Evan Perez, Hanks, 10-0; 7 Javier Robles, Eastlake, 10-0; 7, Daniel Cardenas, Mt. View, 10-0; 7, Vincent Garcia, Coronado, 10-0; 7, Armando Villa, Americas, 10-0; 7, Justine Adebayo, Riverside, 10-0; 7, Angel Escalera, Parkland, 10-0. Long jump: 1, Deion Hankins, Parkland, 21-4; 2, Daniel Rivera, Horizon, 20-5; 2, Angel Jurado, Franklin, 20-5; 4, Onterious Hill, Chapin, 20-4; 5, Ethan Villa, Austin, 20-3.50; 6, Keith Rodriquez, Eastlake, 20-1.50; 7, Isreal Hudson, Franklin, 20-0.50; 8, Karch Gardiner, Del Valle, 20-00; 9, Bryan Suarez, Chapin, 19-11; 10, Kameron Walker, Austin, 19-9; 10, Jacob Vetterkind, Socorro, 19-9. Triple jump: 1, Gabriel Stonewall, Franklin 45-00; 2, Julian Hinojos, Americas, 43-1.50; 3, Kamuel Sloan, Franklin, 42-10; 4, Donta Hayes, Parkland, 42-00.50; 5, Marcos Duran, Mt. View, 41-4.25; 6, Gilbert Rodriguez, Mt. View, 41-2.75; 7, Angle Escalera, Parkland, 40-9; 8, Daniel Rivera, Horizon, 40-8; 9, Vince Armendariz, Americas, 40-2.50; 10, Isaiah Martinez, Parkland, 39-10.5. 100 meters: 1, Caleb Gerber, Pebble Hills, 10.81; 2, Abel Cervantes, Americas, 10.93; 3, Fred Hernandez, Socorro, 11.03; 4, Angel Garcia, San Elizario, 11.26; 5, David Niebla, Montwood, 11.31; 6, Cedric Haynes, El Dorado, 11.35; 7, Jeff Griffin, Andress, 11.40; 7, Ricky Espinoza, El Dorodo, 11.40; 9, Obed Garcia, Mt. View, 11.42; 10, Anthony Quintero, Parkland, 11.46. 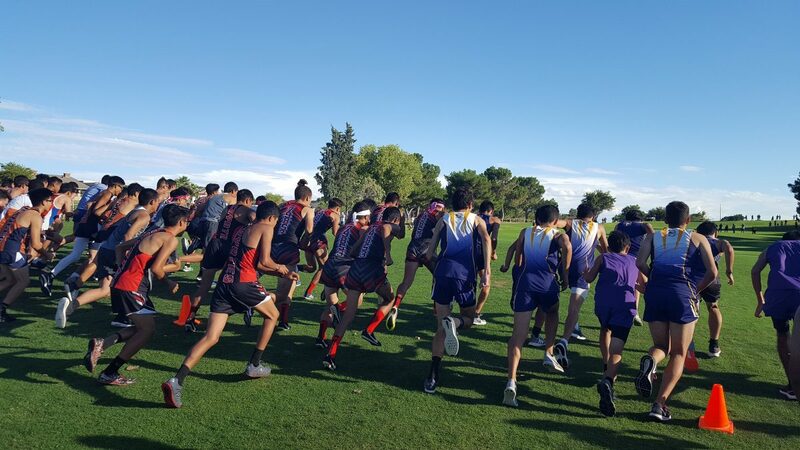 Hanks, Del Valle, Ysleta, Burges, Horizon, Andress, Franklin, Chapin, America, Pebble Hills, Clint, Fabens, Ft. Hancock, Faith and Canutillo will compete at the Burges Boys/Girls meet at 3 p.m. Friday and 8:30 a.m. Saturday. 800 meters: 1, Edwin Gomez, San Elizario, 2:01.69; 2, Michael Abeyta, Hanks, 2:01.78; 3, Noah Yeager, Burges, 2:03.18; 4, Jared Laverty, Americas, 2:03.57; 5, Fernando Morales, Franklin, 2:04.24; 6, Kenneth Golston, Parkland, 2:04.46; 7, Matthew Lindsey, Montwood, 2:04.51; 8, Chauncey Wilkes, Andress, 2:05.02; 9, Kevin Campbell, Americas, 2:05.94; 10, Seth Andrade, Americas, 2:06.32. The third week of the track and field season includes two boys meets on Saturday – Bowie and Burges – where most of the teams will compete. 3,200 meters: 1, Edwin Gomez, San Elizario, 9:57.85; 2, Sergio Leon Cuartas, Eastwood, 10:02.15; 3, Chauncey Wilkes, Andress, 10:07.40; 4, Tyler Rodriguez, Americas, 10:07.45; 5, Jacob Ye, Americas, 10:07.85; 6, Aaron Perez, Eastwood, 10:15.84; 7, Carmelo Corral, Americas, 10:16.84; 8, Israel David, Eastlake, 10:17.68; 9, Jacobo Wedemeyer, Franklin, 10:19.72; 10, Victor Parra, Eastwood, 10:21.70. 110 meter hurdles: 1, Infante Jones, Parkland, 15.11; 2, Dominic Britton, Chapin, 15.56; 3, Caleb Stewart, Americas, 15.75; 4, Vince Armendariz, Americas, 16.07; 5, Gavin Hidalgo, Eastwood, 16.25; 6, Donta Hayes, Parkland, 16.62; 7, Bryan Suarez, Chapin, 16.66; 8, Jacob Luna, Eastwood, 16.71; 9, Chris Martinez, Franklin, 16.90; 10, Joshua Love, Montwood, 17.43. 400 meter relay: 1, Americas ‘A’ (Armando Villa, Abel Cervantes, Ryan Acosta, Julian Hinojos), 43.03; 2, Franklin ‘A’ (Darryn Clark, Angel Jurado, Isreal Hudson, Ethan Bustillos), 44.18; 3, El Dorado ‘A’ (Duane Nelson, Cedric Haynes, George Graham, Chris Bustillos), 44.43; 4, Ysleta (Jalen Promesse, Elias Medel, Giovanni Martinez, Damian Carrasco), 44.70; 5, Pebble Hills ‘A’ (Caleb Gerber, Jim Edward, Jalen Partida, James Hadnot), 44.64; 6, Canutillo (Carlos Amato, Matthew Flowers, Alejandro Alvarado, Sebastian Garcia), 44.91; 7, , Montwood ‘A’ (David Niebla, Carlos Cisneros, Carlos Flores, Evan Cisneros), 45.11; 8, Parkland ‘A,’ 45.12; 9, Horizon ‘A’ (Daniel Rivera, Angel Marquez, Ross Valenzuela, Isaiah Quijas), 45.19; 10, Austin ‘A’ (Kevin Usera, Freddy Elizondo, Moises Morales, Kameron Walker), 45.21. Bel Air, Eastwood, Parkland, Riverside, Bowie, Cathedral, Mt. View, Coronado, Austin, Irvin, Jefferson, El Dorado, Montwood, Eastlake and San Elizario will race at the Alberto Estrada Bowie/Cathedral Boys Track Meet starting at 9 a.m. Saturday, March 2. 800 meter relay: 1, Americas ‘A’ (Ryan Acosta, Abel Cervantes, Julian Hinojos, Armando Villa), 1:30.07; 2, Franklin ‘A’ (Darryn Clark, Angel Jurado, Ian Tharp, Omajuwa Etiwe), 1:30.76; 3, Pebble Hills ‘A’ (Isaiah Davis, Ian Edward, Sebastian Ochoa, Galeb Gerber), 1:31.14; 4, Austin ‘A’ (Moises Morales, Kameron Walker, Miguel Vazquez, Kevin Usera), 1:34.09; 5, Montwood ‘A’ (Diego Herd, Angel Robles, Max Ayala, Brandon Williams), 1:35.30; 6, Eastwood ‘A’ (Marcus Ransom, Xavier Avila, Osmar Ibarra, Eddie Cruz), 1:35.55; 7, San Elizario ‘A’ (Jerry Anderson, Chirs Olvera, Alexis Gurrola, Angel Garcia), 1:35.62; 8, El Dorado ‘A’ (Duane Nelson, Cedric Haynes, Geroge Graham, Chris Bustillos), 1:35.75; 9, Parkland ‘A’ 1:35.7910, Del Valle (Victor Gomez, Irvin Lopez, Eric Luera, Alejandro Rosales), 1:36.12; 10, Horizon ‘A’ (Daniel Rivera, Joshua Guerra, Ross Valenzuela, Isaiah Quijas), 1:38.22. 1,600 meter relay: 1, Americas ‘A’ (Ryan Acosta, Julian Hinojos, Sir Drennan, Abel Cervantes), 3:24.33; 2, Franklin ‘A’ (Ian Tharp, Ethan Bustillos, Fernando Morales, Omajuwa Etiwe), 3:24.73; 3, Parkland ‘A,’ 3:36.04; 4, Austin ‘A’ (Steven Montoya, Miguel Vazquez, Andrik Zamora, Ethan Villa), 3:36.09; 5, Montwood ‘A’ (Matthew Lindsey, Brandon Williams, Kenneth Dominguez, Christian Rivera), 3:36.92; 6, San Elizario ‘A’ (Alex Devora, Alexis Maldonado, Tony Diaz, Alexis Gurrola), 3:37.31; 7, Coronado ‘A’ (Nick Gonzalez, Josh Espino, Alan Alba, Liam Walsh), 3:37.81; 8, Eastwood ‘B’ (Jacob Luna, Gavin Hidalgo, Osmar Ibarra, Xavier Avila), 3:37.82; 9, Eastlake ‘A’ (Kevin Aravelo, Lorenz Smith, David Christobal, Michael Garcia), 3:41.35; 10, Del Valle ‘A’ (Gianluca Cuevas, Issac Garcia, Irvin Lopez, Eric Luera), 3:43.69.